Welcome ~ to some frequently asked questions. Hope you find these answers helpful! If you need further assistance drop a line at hello@dajanadesign.com. Have a beautiful day! Is your jewelry available in any retail stores? …. My designs are not located in jewelry stores at this time. Good news though~~~ I’m on Etsy!! Lots of fun pieces there. www.etsy.com/shop/dajanadesign. Sure can~ I love to do custom work and I’d be so flattered to create something for you perhaps for a wedding, bridal gifts or even special memorial gifts. Please visit the custom order page for more details. I offer 2 different size gift boxes for you to choose from. The small gift box is $1.50 and it’s the perfect size for earrings or bracelets. A larger box is available for $2.50 and is a great size for necklaces or multiple items to be wrapped inside one box. 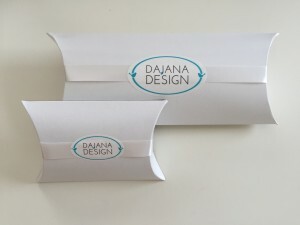 The jewelry will be wrapped in tissue then placed in the gift box with white ribbon and a pretty lil’ Dajana Design label. Do you offer gift enclosure cards? Yes~ and the best part is it’s FREE! I will handwrite your message (up to 75 characters) for you if need be or I can insert the card blank for you to complete your special message. I do not offer envelopes simply because once they are opened they usually get thrown away~ no need to put more paper out into the environment. What are your shipping and handling methods? Shipping is a priority at Dajana Design. I want you to get your pretty lil’ shiny things right away! The shipping timeline varies based on a few variables such as if the item is made to order or if it is custom work which requires more time to design. Sometimes it is due to potential vendor and supplier delays. Currently we ship anywhere within the continental US. At Dajana Design, great care is taken to ensure each item is individually wrapped for protection and handled with care. We ship packages via USPS at a flat rate of $2.85 for one item and .70 per each additional item. Should you need priority mailing or overnight services please contact me at hello@dajanadesign.com or via the contact page. Additionally, check out the FREE “Pick-Up @ Starbucks” option which is a fun way to get your jewelry. This delivery option is available on select dates and times at the Seymour Starbucks located in the Oxmour Plaza at 253 West St. Seymour CT 06483. Do you ship to third parties? Yes~ that’s not a problem at all. If the jewelry is a gift (and who doesn’t LOVE jewelry as a gift? ), I will be sure to send the receipt to the gift giver. Don’t forget to add gift boxes to your cart should you need them! I’m happy when you are happy! If you happen to order stocked item(s) from Dajana Design and when it arrives you decide you are just not loving it (although what’s not to love ?) you can certainly exchange the item(s) within 14 days of delivery date~ that’s cool with me! Please ensure the jewelry is in perfect condition before you ship it back to Dajana Design so that the item(s) can be resold. Please keep in mind you would have to pay the shipping fees for both the returned item(s) and the item(s) you are getting in exchange~ thank you for understanding. For the record there are no restocking fees at Dajana Design. Lastly please note that custom orders are not returnable, but we don’t have to worry about that as I’m hopeful you will cherish your custom pieces! First of all~ that would be a bummer. Secondly email me upon delivery at hello@dajanadesign.com and I will take care of it. Be sure to include your full name in the email as well as a description or photo of the issue. I will send you a prepaid envelope so you can mail the item(s) back to Dajana Design PO BOX 23 Seymour, CT 06483. I will repair or replace the item(s) and the replacement shipping would be on me for sure~ no worries. Some of the jewelry I create may be listed as limited edition for various reasons. I may choose to create something unique and the beads may be rare and difficult to relocate. The other case may be simply because it might be a seasonal item or my suppliers have backorders that can affect my ability to make more pretty lil’ shiny things in a timely manner. Is your jewelry just for adults? Yes~ my jewelry is designed for adult use only. As you know my jewelry is made of small parts and small parts and children are not a good mix. Safety first! The majority of my jewelry is made with silver plated and gold plated findings. Over time metals can tarnish a bit through oxidation when in contact with water and air. I suggest avoiding lotions or perfumes coming in direct contact with the jewelry. Also take your jewelry off before hopping in the shower or plunging into a luscious pool. What's the best way to prevent my beads and crystals from chipping and scratching? This is a great question. Many of the pretty lil’ shiny things I create at Dajana Design are made with glass or artisan crystal. Due to the nature of artisan crystal there may be slight inherent imperfections which add charm and character to the piece. However artisan crystal and glass beads may chip if dropped or tossed harshly. When not wearing your jewelry I suggest putting it away in the organza bag or box it came in or just store it in your jewelry box or your massive jewelry armoire!